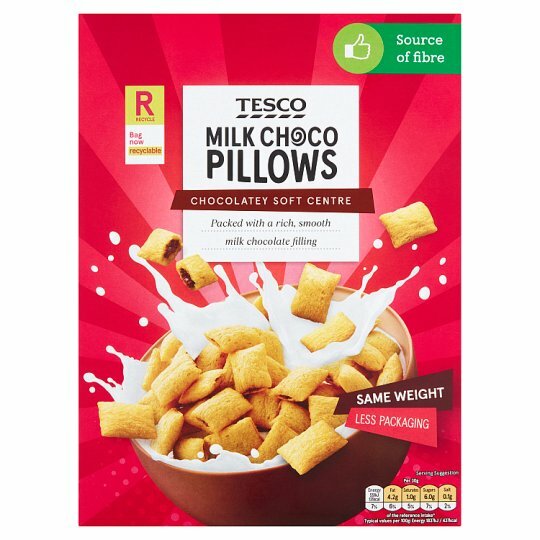 Cereal pillows with a milk chocolate filling with added vitamins and iron. Milk Chocolate Filling (35%), Rice Flour, Wheat Flour (Wheat Flour, Calcium Carbonate, Iron, Niacin, Thiamin), Oat Flour, Maize, Sugar, Salt, Sunflower Oil, Emulsifiers (Sunflower Lecithins, Mono- and Di-Glycerides of Fatty Acids), Colour (Mixed Carotenes), Maltodextrin, Dextrose, Iron, Vitamin E, Antioxidants (Ascorbyl Palmitate, Alpha-Tocopherol), Niacin, Pantothenic Acid, Vitamin B12, Vitamin D2, Thiamin, Folic Acid, Citric Acid, Riboflavin, Vitamin B6. Milk Chocolate Filling contains: Sugar, Rapeseed Oil, Milk Chocolate, Palm Oil, Dried Whole Milk, Milk Sugar, Whey Powder (Milk), Cocoa Powder, Emulsifier (Soya Lecithins), Flavouring. Store in a cool, dry, odour free place., To retain freshness fold over inner bag after use., Contents may settle during transit.